Qualifications Required: Retail experience is not necessary in running a NightOwl, but motivation and entrepreneurial skills are a must. Training and Support: If you want continued growth year on year, you've come to the right place. You'll never be left without support. We continually invest in franchisee training, modern marketing methods, advanced technology and systems, profitable supplier relationships, store refurbishment andcontinued expansion into the convenience market. Marketing Support: A strong and dedicated Franchisee Support Office and Marketing Team encourage and support franchisees to reach their maximum potential. Guaranteed Income: 1st Year Turnover Guaranteed! Agree Terms: The NightOwl standard franchise agreement is 10 years and additional five-year renewals are available subject to NightOwl's approval. First franchised in 1987, we have never stopped growing and with an exceptionally strong brand presence, we now operate over 73 stores throughout Queensland and New South Wales. Retail experience is not necessary in running a NightOwl, but motivation and entrepreneurial skills are a must. You must be determined to succeed and the Franchisee Support Office will help you with the rest. 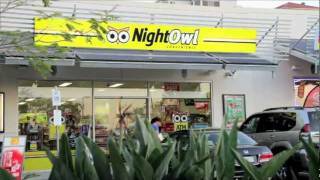 NightOwl is Australia’s largest stand-alone convenience brand with investment opportunities available throughout QLD and NSW in a range of demographics and business models.